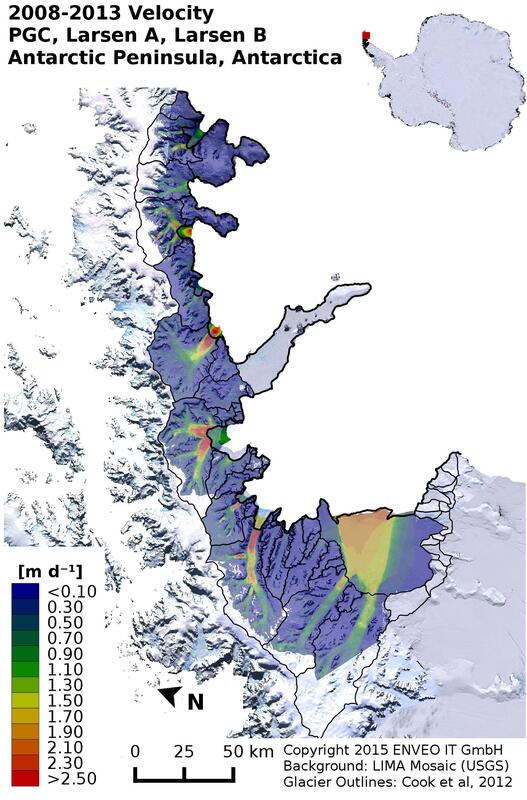 The project on Multi-sensor Analysis of Glacier Response to Climate Change on the Antarctic PenInsula (GlacAPI) aims at reducing the uncertainty of mass balance estimates of Antarctic Peninsula glaciers by exploiting archived and newly acquired multi-sensor remotely-sensed data sets, complemented by in-situ field data and models. These datasets are used to acquire detailed flow velocity fields and surface elevation changes and to investigate interannual and seasonal changes in ice export. GlacAPI will allow for better estimates of the mass balance of Antarctic Peninsula glaciers and their contributions to global sea-level rise and contribute to a better understanding of outlet glacier response after ice shelf disintegration. Understanding these processes is a requisite for predicting the response of the large ice masses of West Antarctica, which are butressed by ice shelves, to continued warming. GlacAPI is led by ENVEO in collaboration with the British Antarctic Survey (BAS) and the German Aerospace Center (DLR) and is supported by the European Space Agency (ESA). The project began in June 2012 and lasted for 18 months.